POSSIBLE SPOILERS AHEAD. I've been excited about seeing Guardians of the Galaxy since it was announced. I knew very little about the comic the movie is based on—I've learned a bit since then—but I was excited, regardless. (I am becoming more and more a Marvel fangirl.) Plus, any movie in which two of the five main characters are a talking raccoon and his BFF, a tree creature that can only say "I am Groot" in various inflections? SOLD. Guardians of the Galaxy is about a group of misfits/outlaws/criminals who don't want anything to do with each other at first, but soon find themselves working together out of necessity to save the galaxy (and their own hides) from a crazed villain hell-bent on destruction. The movie ties into the already filmed Marvel 'verse via the end-credits scene from The Avengers, in which we got a glimpse of Thanos, and the mid-credits scene from Thor: The Dark World, in which we met The Collector (Benecio del Toro). This film has a somewhat different feel than the other Marvel movies we've come to know and love, however, in that it's a little sillier and a little lighter. It fits in with the rest of the movies well, but the main cast—Chris Pratt as Peter Quill, Zoe Saldana as Gamora, Dave Bautista as Drax and Bradley Cooper and Vin Diesel voicing Rocket Raccoon and Groot, respectively—aren't your typical superheroes. They're not superheroes at all; at least, not the Captain America and Thor kind. They're outlaws/criminals who just so happen to also have hearts of gold. The actors, both the main five and the supporting ones, are all fantastic in this movie. Chris is so great as Peter Quill (a.k.a. Star-Lord) with his "big talk and somewhat smaller action" persona. I was really impressed with Dave Bautista, too. The plot isn't exactly Oscar-worthy, but if you're going to a Marvel movie for deep philosophical ideas ... you obviously have someone else's tickets. I was also impressed with the quality of the CGI—both Groot and Rocket actually look like living creatures, rather than cartoons. If you're a fan of Marvel's superhero movies, particularly the snarkier/more lighthearted bits, then I'm certain that you'll enjoy this film. I don't think I stopped laughing the whole film. Not perfect, but I really enjoyed it. Would much rather watch this than whatever bombastic nonsense Michael Bay has on offer. I adored this movie. When we left, we were discussing whether or not we enjoyed it more than Winter Solider. In the end, we decided they really can't be compared as they are two completely different types of movies, despite both being Marvel movies. 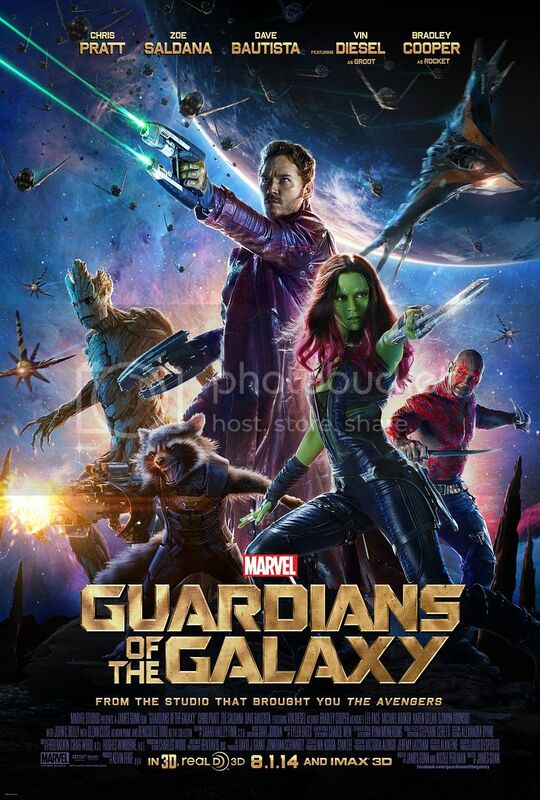 What I adored about Guardians was that it really felt like I was watching a comic book. From the humor, the silliness, to the costumes and over the top villain. I loved that. I still love the darker more 'real' superhero flicks, but this was so refreshing! It's hard for me to think of a better time I had at the theater! This was just such a fun, enjoyable, wonderful movie that I need to go see it again. And again. And again. EXACTLY. My ratings aren't really on perfection, just how much I enjoyed it. And I enjoyed it tremendously. They're definitely to different things. I think they work in the same universe fine, though—not everything in our universe is always for serious, you know? It's nice that Marvel took a chance on the sillier side of things. Haha! I love that you've see it twice already. I really want to see it again before it's out of theaters. And the soundtrack is killer! I was grooving to it a ton before the movie actually opened. I love the mix of old and new the movie encompasses. I hope you get to see it soon! It's fantastic. And I want to check out the comics, too! Before a friend invited me, I wasn't interested in seeing it. I was very impressed with it and the acting was all fantastic. It's become one of my favorite marvel movies and I can't wait to get it on DVD in a couple months. Yay! I'm so glad to hear that. I get excited (probably a little too excited) whenever a new Marvel movie is announced, even if I've never been interested in the characters before. I can't help it!